It’s my new Whatever…whatever that means! Really, I’m going to start Whatever Wednesday, ostensibly to offer a great recipe from my years of archives in a quick format (like this quick and simple Chicken Marsala) with photo and recipe only. I might occasionally throw in a fun little giveaway like today or might not even make it one week…so Whatever Wednesday just seems to fit! When my kids were young and I was a single parent I recall making a lot of casseroles, some planned and some much like what I did for dinner on this night. Leftovers were golden and and casseroles like this were a favorite. It all started with some leftover chicken, mushrooms that were still good but might not be in another couple of days and some rice in the pantry. Those ingredients combined in a Marsala cream sauce made for a quick and tasty meal. I’ve definitely done this over the holidays too when the glut of turkey means leftover heaven! Try this Chicken with Mushrooms, Rice and a Marsala Cream Sauce using some of that turkey…it’s so much better than a sandwich that tastes just like Thanksgiving dinner! In a large skillet, heat the butter over medium-high heat until just melted. Add the onions and cook, stirring occasionally until they have started to caramelize and brown. Sprinkle the flour into the mixture, stir and cook for1 minute. Add the wine, half and half and milk and simmer, stirring occasionally, until slightly thickened, about 3 minutes. Season to taste with salt and pepper. Stir in 2 cups water and the rice. Grease a large casserole dish and spread the chicken on the bottom. Pour the mushroom and rice mixture over the chicken; made sure the rice is evenly distributed in the dish and cover the dish with aluminum foil. Bake until bubbly, about 35 minutes. Combine the bread crumbs and the Parmesan cheese; sprinkle on top and bake for 5 minutes more. I love served with a green vegetable and a simple salad. You are most welcome Mandie; hope you enjoy it as much as we do! I’m with you Shannon. I am sometimes driven to make a dish with mushrooms cause I might have forgotten I bought them! 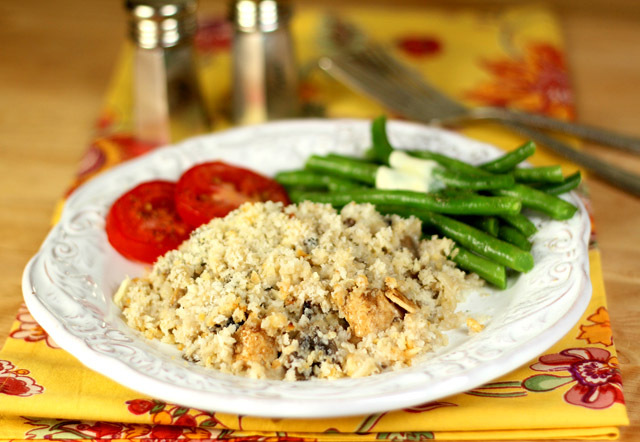 Do a search on my site for Creamy Mushroom Bake; simply the most wonderful mushroom dish ever! I really have shied away from casseroles since my kids aren’t around and this was so good I have to rethink that! I loved that little gift; I think it would be a wonderful treat for your dad. Me… Everything is for me! Hehe…and in this instance? You were right! Congrats; it will get shipped to you this coming week. I would order it for any of my girls – Kathy, Amanda, you or Janis – because you all listen to my insanity. Marsala cream sauce yum!!!! this sounds great – would love to try! For me… because I deserve treats too. This is a great idea..and very cost affordable! That’s what I love. They work out deals with the vendors; the retail of all products is more than want we pay AND that it includes shipping? I know what I’m doing for holiday gifts for my dad already. Whew! I love the sound of your chicken and marsala cream sauce! Yummy! Seems like a good comfort food recipe for the cooler weather that will soon be here! Also like your idea of “whatever Wednesdays”. A great way to recycle some recipes! I will order for myself and I will make it a family thing! It will be great for my son (3.5 yo) as a monthly surprise, and a great introduction of different products. I hope we win it!!! Ooh!! Pick me! I am a teacher and just started the year back, and I would love to have a monthly surprise sent to me!!! All the other teachers would be jealous and I would have to share!!! I love your new “Whatever Wednesday” idea. So clever and what a great way to revisit some of those volumes of recipes you have on hand! Just fFabulous. And so is that wonderful gift box. I especially like the idea that it’s all from small artisan food companies. What a great way to give them an assist. I would love a monthly delivery for my family! My daughter is 3, her absolute favorite food is granola bars & getting “presents” in mail is “the best thing ever” in her opinion. It would be awesome to win it so I could see her face when it is delivered 🙂 Thank you so much the chance to win. Also, I can not wait to try this recipe..love love love chicken, rice, & mushrooms together! I would send it to my sister. Hard times leaves her with gourmet taste on a ramen noodle budget. She would be ecstatic! Years and years ago I made a dish similar to these a couple of times, and then promptly forgot about it! This looks terrific – I need to do it again. Marsala and mushrooms is such a nice combo. Thanks for this. You sound like me! I’m not sure why my kids growing up meant no more casseroles; I’ve LOVED having this around this week; nothing wrong with leftovers of a dish made from leftovers right? What a lovely giveaway. Not in the right spot but the winner will be lucky indeed. Your chicken and mushrooms would make a perfect meal. I love dishes like this. I’d love to get this for myself! It’d be an awesome way to discover new products without having to do the “legwork”! Sounds like a great company. Oh…and if I HAD to send this to a friend, I’d send it to my best friend in MO, who has a new baby, is a Chef at SLU, and somehow maintains her sanity! Whatever works for me! Holy crap – yeah I TOTALLY want this for myself! Greedy? Nah. I mean at least *I* know *I* would love it! Sample boxes seem to be all the rage and a foodie one, I’m gonna have to look into getting myself one. Why I am not surprised to see sliced tomatoes on the plate? Great looking dish Barb an I’m looking forward to Whatever Wednesdays…a lot! P.S. Not entering the giveaway. I would love to have that gift box for ME!! 🙂 I might sign up, actually…. I’d order it for my daughter…she loves to snack on new foods! What a great idea. So fun! I get a similar deal from a company called Birchbox, only it’s samples of great beauty supplies each month for $10. What a great idea. I would order a monthly delivery for my husband. He does all the cooking in our house and it would be a great surprise to treat my love with yummy goodies. I would order it for my brother who is in college! Well, Wednesdays just got better! Thanks for sharing Petit Amuse with us. I think I will sign up (at that price how can I not) and use the box of treats to surprise someone special each month. Sort of like a Secret Santa for the year. Fun! I would order it for me but would share contents of course !! Wow, I hope I hope Ben at Petite Amuse is marketing as I type to parents of college students going back to campus. This box is so much better than the snack boxes that are marketed to parents…those contain basic crappy food. That being said, I’d send a box to my son, Scott, who is at the University of Utah. When I was in Utah I always made him freshly baked cookies and always cooked great meals. I know he cooks well but he hasn’t mastered baking yet. I know he would love the treats. I love that you’ve quickly acted on your whatever wednesday idea you were exploring last week … and with a bonus giveaway … nice! I have to admit, that I’d love to receive a box of goodies like that every month … and for $10, including shipping ? score! My little sister is on my mind right now because she just had knee surgery on monday … and has a recovery in front of her – so I’d order the monthly delivery for her so that she’s got something special and unexpected to look forward to every month! actually i would love it for myself but i would send it to my son, as he has been homesick. I definitely want monthly delivery for myself! I love this idea. Great giveaway! And living this new idea of Whatever Wednesday! This first recipe is perfect for my family. Although, my picky husband will surely turn his nose up at the mushrooms. He’ll have to eat around them cause this is going on the menu this week! I will save this recipe and plan to make it when my parents visit in October. Chicken marsala is a favorite of theirs but I love the idea of having a casserole ready to go. The giveaway looks great too. Although I’d love it for me, I think I’d send it to my grandmother so she could enjoy a surprise in the mail. I’ll be sure to check out the website. This sounds so good! Thank you for sharing the recipe!